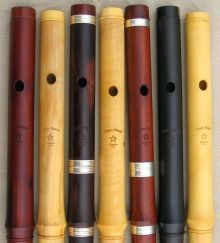 Casey Burns Flutes are professional performance instruments for Irish and other traditional music, based upon the acoustical models of 19th century makers such as Rudall & Rose, Boosey (Pratten), and Prowse. Each instrument is meticulously crafted from carefully selected, air-dried tonewoods. Keywork and bands are made from Sterling silver. Casey's flutes are an intelligent balance of tradition and innovation, comprising careful improvements of the traditional acoustical models, and a deceptively modern aesthetic that preserves the best features of their historical forbearers. The experience of over thirty two years and thousands of instruments has resulted in an instrument gratifying for beginner and professional alike. We invite you to learn more about these remarkable flutes, and look forward to discussing with you the appropriate instrument for your needs. Casey Burns D Flute Models: These are the "flutes du jour" - my standard flute models with three fingerhole spacing options and a Rudall-based flute option. These flutes can come with tuning slides and bands, as well as keywork. For more information click here. The New 2015 Irish Flute Combo: My D flutes with tuning slides can also come with a package that allows one to play in several other keys besides D and G. Also available as a retrofit package for existing D Casey Burns Flute models with tuning slides. For more information click here. Low Flutes: I make lower pitched flutes in the keys A, Bb, B and C. For more information, click here.